Lagos, Nigeria 28.01.2019 – Sèmè City, the International Knowledge and Innovation City, has partnered with theTony Elumelu Foundation (TEF), the leading philanthropic organization empowering African entrepreneurs to train and empower additional 50 Beninese entrepreneurs. Sèmè City will join a growing list of governments, development agencies and private sector organisations partnering with the Tony Elumelu Foundation to explore the Foundation’s sustainable model of philanthropy geared at addressing the root cause of poverty in Africa while creating jobs and economic wealth for all. As part of the partnership with the Foundation, Sèmè City will invest $250,000 for the sponsorship of 50 additional Beninese entrepreneurs with innovative projects across various sectors ranging from tourism to health, energy, ICT, environment, fashion, media, entertainment and agriculture. This partnership aims to provide beneficiaries with the necessary skills to develop high-impact ventures as well as encourage female entrepreneurship. The 50 beneficiaries will be selected in addition to the 1,000 African entrepreneurs selected during the 5th edition of the Foundation’s flagship Entrepreneurship Program. The beneficiaries will benefit from the training and mentorship programme offered by the Foundation, at the end of which they will receive $ 5,000 each to develop their businesses which will, in turn, contribute to the creation of jobs and wealth in Africa. Speaking about the partnership, the incoming CEO of the Tony Elumelu Foundation, Ifeyinwa Ugochukwu said: “We have always advocated for a collaboration between the public and private sector and this partnership exemplifies our conviction that working together to empower African entrepreneurs is the only way to create sustainable economic development on the continent”. The Managing Director, Sèmè City Development Agency, Claude Borna, said: “Sèmè City supports innovative entrepreneurship so that it becomes a key growth factor to boost productivity, create jobs and help improve the quality of life in Benin. With its unique large-scale programme that promotes “Africapitalism”, the Tony Elumelu Foundation is a partner of choice to accomplish our mission of developing a vibrant knowledge-based economy in Benin”. Other partners of the Tony Elumelu Foundation who have committed to empowering additional entrepreneurs include Indorama, United Nations Development Programme (UNDP), International Committee of the Red Cross (ICRC) and Deutsche Gesellschaft für Internationale Zusammenarbeit (GIZ). Interested entrepreneurs are encouraged to apply for the programme on www.tefconnect.com. 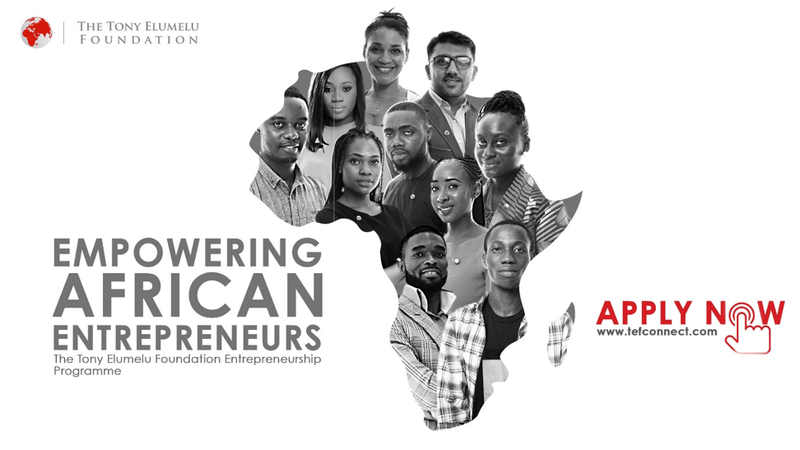 Established in 2010, the Tony Elumelu Foundation (TEF) is the leading philanthropy in Africa championing entrepreneurship and entrepreneurs across the continent. The Foundation’s long-term investment in empowering African entrepreneurs is emblematic of Tony Elumelu’s philosophy of Africapitalism, which positions Africa’s private sector, and most importantly entrepreneurs, as the catalyst for the social and economic development of the continent. The Foundation’s flagship initiative, theTony Elumelu Foundation Entrepreneurship Programme, is a 10-year, $100 million commitment to identify, train, mentor and fund 10,000 entrepreneurs, capable of changing the face of business across Africa. Sèmè City, the International Knowledge and Innovation City, brings together higher education and professional training institutions, research centers, incubators, as well as open innovation spaces. This one-of-a-kind innovation campus is planned over 200 hectares in Sèmè-Kpodji, a peri-urban area of the Republic of Benin, located 5 km from the Nigerian border. Sèmè City’s mission is simple: put knowledge, innovation, and entrepreneurship at the service of inclusive and sustainable development. The objective is to create 190 000 new jobs by 2030 including at least 40% by women and 30% self-employed. Posted in News, Press Release.